Stumbled upon this blog where I read about this vim tags plugin. So I got my E2 Electricity Monitor the other day and hooked it up. The actual work took less then 5 minutes (although it took me 2 days to find some time to go buy bateries - 3x AA and 3x AAA bateries are required). The mobile unit is very handy in that you can easily cary it around to measure specific appliance electricity usage. 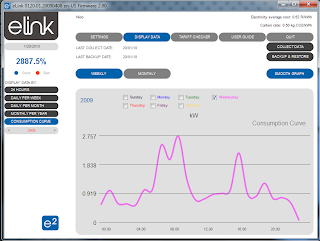 The monitor receives data every 6 seconds so when you switch on or off an appliance you will quickly see the watts climb or drop and the difference is obviously the the amount of watts that particular appliance draws. 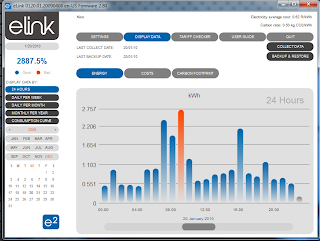 On the graph you see a spike of around 2.7KWh but the truth is that at peak I measured about 4.7KWh with the geyser running and a kettle boiling water (a likely scenario). Also note that I can manually switch my geyser on with the new control unit I had installed with the solar geyser. The average peak however is much lower, since it measures consumption over the hour and the kettle (as an example) boils water within 5 minutes. 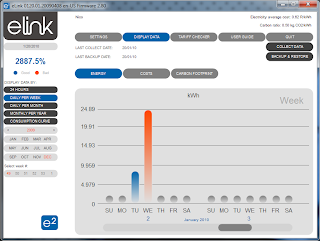 My true electricity usage peak is around 5 KWh (max) - this will help me a lot when deciding on a pure solar energy solution later in the year. I first have to get more data, especially during winter, before I can accurately size a solar solution. I can also now look at ways to save electricity, but without waiting for the end of the month's electricity bill - the results should be available within a day or two. I added some notes on my Google page for those interested.